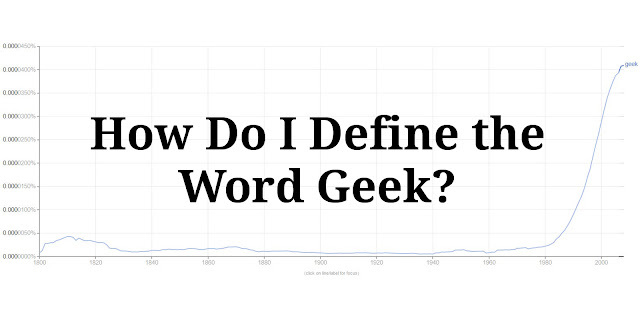 Defining the word geek can be complicated. The word geek has changed over time. Oxford dictionary covers the change that started in the 1990s. Using Google Books Ngram Viewer, we see that the word "geek" has shown up in books more and more since the 1990s. This is why it's so important that I share with you how I define being a geek. When it comes to how I define the word geek, I don’t make it complicated. I use the word geek and nerd interchangeably. I look at being a geek like National Novel Writing Month (NaNoWriMo) looks at writing. They look at writing in that if you think what you’re writing is a novel then it’s a novel. The point of the challenge is to write 50,000 words in the 30 days of November. They don’t care what you write as long as you do it! It's the same with being a geek. If you think you're a geek, then you are one! If you think you’re a geek and you have a geeky pursuit, then you’re in the right place! Questions? Comments? Email me at toni@normalnotfound.com!